Fellow commentators Mike Breen and Mark Jackson chided their longtime colleague, but Van Gundy’s brief moment of distraction was warranted — she’s one of the biggest pop stars and most beautiful people in the world. But it wasn’t just Rihanna sitting courtside at Oracle Arena in East Oakland, California. Maybe it’s the trilogy effect, but this may just be the most star-laden NBA Finals ever. Aside from Rihanna, Jay Z, Kevin Hart, Marshawn Lynch, Power’s Omari Hardwick and Bay Area legends Too $hort, Raphael Saadiq and E-40 were all in attendance — either courtside or a few rows back. Yet, it was Rihanna, from her plush digs — on the announcers’ side just a few seats away from Jay Z — who made worldwide headlines by matching wits with Kevin Durant. The Grammy winner and 2014 NBA MVP locked eyes on more than one occasion as Rihanna used her multimillion-dollar voice to chastise Durant. Rihanna came up short, though as KD dropped 38 points in a Game 1 blowout victory. As Muhammad Ali’s fights were makeshift Met Galas for actors, actresses, musicians and hustlers, at 2015’s Floyd Mayweather/Manny Pacquiao bout, Jay Z, Beyoncé, Don Cheadle, Jake Gyllenhaal, Robert De Niro, Denzel Washington, Antoine Fuqua and more piled in to Las Vegas’ MGM Grand. But what makes the professional basketball courtside experience different is that the attendee is sitting right on top of the game. Courtside is more intimate than ringside: One’s feet are literally on the field of play. Jay Z refers to himself in 2009’s “Empire State of Mind”: Sitting courtside / Knicks and Nets give me high fives / N—-, I be Spiked out, I can trip a referee. This is far from Shawn Carter’s first courtside homage. On Cam’ron’s 2002 anthem, “Welcome To New York City,” Jay boasts: I ain’t hard to find/ You can catch me front and center / At the Knick game, big chain in all my splendor/ Next to Spike if you pan left to right/ I own Madison Square / Catch me at the fight. It makes sense that both these lyrical moments nod at the world’s most famous Knicks fan — and courtside royalty — director Spike Lee. It’s Lee — Rihanna’s courtside prophyte in a sense — who stars in basketball’s most well-known courtside beef. 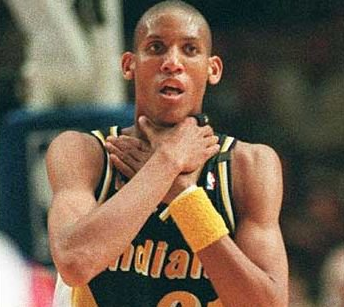 He and Reggie Miller’s infamous back-and-forth during the 1994 Game 5 of the Knicks vs. Pacers Eastern Conference finals was defined by Miller’s 25-point fourth quarter and capped off with Miller’s choking gesture to Lee. The tense moment is immortal, iconic NBA playoff lore. For the Los Angeles Lakers, courtside culture can be dated to the legendary actress Doris Day, better known as “the Neil Armstrong of Lakers’ celebrities.” Day, the biggest female box office star of the late ’50s and early ’60s, opened the courtside door at the Los Angeles Sports Arena. Fellow A-listers such as Dean Martin, Jack Lemmon and Walter Matthau followed her in to watch future Hall of Famers Jerry West and Elgin Baylor lead the Lakers to multiple Finals appearances. The move from Minneapolis to Los Angeles made the Lakers the NBA’s first West Coast squad in 1960 — a move directly influenced by Lakers owner Bob Short noticing the financial gold mine the Dodgers found in L.A. after their move from Brooklyn, New York, two years earlier. The appearance of celebrities courtside exploded in the era of the Magic Johnson-led “Showtime” Lakers. Johnson embodied 1980s Hollywood — the flashy play, the good looks and, of course, that 2,000-watt smile. Comedian Arsenio Hall was a regular at the Forum, as was singer Dionne Warwick, Michael J. Fox, Ted Danson, Jimmy Goldstein and, most famous of them all, Jack Nicholson. These were kings and queens of that era’s show business realm. “If you’re an A-level person, and we know the fans are going to go bananas when your picture goes up on the scoreboard, then there’s a value having you there,” Barry Watkins has said. He’s the Madison Square Garden Co.’s executive vice president and chief communications officer. He’s the plug when it comes to courtside seats at the Garden. “It’s a big part of the brand. Win or lose, it’s one of the reasons people come to the games.” Entertainers want to be entertained, too. Plus, basketball and Hollywood were meant to be significant others off the rip: talent, egos, competition, drama, controversy and animosities, all playing out under the bright, bright lights. According to Shawn “Pecas” Costner, vice president of player relations at Roc Nation Sports, the continued charm of courtside seats has largely to do with the popularity and influence of hip-hop culture. “The flyest thing you can do at a basketball game — besides play in the game — is sit courtside,” he said from his New York City office. The game itself was one of the more entertaining All-Star Games in recent memory, the highlight being a LeBron James vs. Kevin Durant scoring barrage. Pecas and friends documented the memories on social media with hashtags such as #OnTheWood, and #Woody Harrelson. In Pecas’ office hangs a framed photo of himself in the New York Daily News. He looks on as Kevin Durant, now a Roc Nation client, flushes home a dunk with James, Kobe Bryant, Carmelo Anthony and Kevin Love looking on. As for this year’s NBA Finals, Pecas said he can’t even begin to predict the number of celebrities who’ll be sitting courtside for however long the Warriors and Cavaliers do business. The possibilities are limitless because the NBA is more committed to its fans both domestically and abroad than any other American sports entity. While cries of superteams killing the product cause constant debates at social media and on sports talk shows, the NBA celebrated its third consecutive record-breaking year of fan attendance. And the NBA certainly loves the social status of having some of the world’s biggest celebrities taking in the game mere feet away from some of the world’s most popular athletes. The photos below showcase some of those personalities, from yesteryear to the present. Jay Z and Kevin Hart share a laugh at Game 1 of the 2017 NBA Finals between the Golden State Warriors and Cleveland Cavaliers. Time heals all wounds, so one can only hope they’re sharing a laugh about the time the comedian once spilled an entire bottle of pineapple juice on Jay Z and his wife, Beyoncé, in a nightclub. Never, ever doubt Spike Lee’s loyalty to his New York Knicks. Here’s the famed director in January 2013 at London’s O2 Arena for a regular season game between the Knicks and Detroit Pistons. This won’t happen — but if the Knicks win an NBA title within the next 15-20 years, Lee needs to be the first person to hoist the trophy. That’s the least we can do after the powers that be robbed him (and Denzel Washington) of an Oscar for Malcolm X. While I did get to attend Dave Chappelle’s famous Juke Joint party this year in New Orleans, I’m greedy. This is the same reaction I have every time I think of the Chris Rock/Chappelle superset they did in The Big Easy in late March. In reality, it’s Rock gesturing at Will Smith at Game 5 of the 2012 Eastern Conference semifinals between the Boston Celtics and Philadelphia 76ers. On the bright side, Mary J. Blige got a chance to see Kobe Bryant drop 50 points on Steve Nash and the Phoenix Suns in Game 6 of the 2006 opening round quarterfinals. On a not-so-bright side, it’s almost as if you can see the inevitable written on her face — the Los Angeles Lakers blowing a 3-1 series lead and Bryant having the most controversial game of his career in Game 7. Sean “Diddy” Combs and Snoop Dogg: Pictured at Game 6 of the 2010 Finals between the Celtics and Lakers, neither knew the series would shift that night when center Kendrick Perkins went down with a knee injury. There’s also no confirmation if the two spoke of their appearance on The Steve Harvey Show as they attempted to quell the simmering East Coast-West Coast tensions 13 years earlier. At this point, the New York Knicks need whatever residual prayers are left over from Whoopi Goldberg’s Sister Act series. LeBron James and Drake: There’s no rapper currently who enjoys the perks of sitting courtside more than Drake. Perhaps paying respects in The 6, that’s LeBron James taking a drink from Kevin Hart and giving it to the Toronto Raptors ambassador during the 2016 All-Star Game in Toronto. Everyone wanted hottest ticket in America in the fall of 2010 to see the Miami Heat’s new “big three” of Chris Bosh, Dwyane Wade and LeBron James. Including the greatest of all time herself, Serena Jameka Williams. Jack Nicholson and Michael Jordan: The Joker and The Cold Blooded Killer post up at the Great Western Forum in Los Angeles on Feb. 28, 1999, for a game between the Los Angeles Lakers and Houston Rockets. The night featured six Hall of Famers (Scottie Pippen, Charles Barkley, Hakeem Olajuwon, Shaquille O’Neal, Dennis Rodman and MJ, himself, courtside). Seven including future Hall of Famer Kobe Bryant. Stuart Scott, Samuel L. Jackson and Allen Iverson — In one of the cooler sports pictures out there, we’ve got three legends. One in Samuel L. Jackson who, if he doesn’t by now, should have a trademark on the word “m-----f-----.” Two, we have Allen Ezail Iverson, 2016 Hall of Fame inductee and NBA living legend. And three, Stuart Scott doing what he always did best. R.I.Booyah, Stu. We still miss you. Murder Inc.’s two genius creative seen here in 2002 at a Houston Rockets/Golden State Warriors game. That year — ironically the one before 50 Cent became global sensation — was a good one for the label. Ja Rule and Ashanti’s “Always On Time” and “Down 4 U” both made Billboard’s year-end Hot 100 Singles. Here we have Diana Ross at a Knicks and Charlotte Hornets playoff game with her sons. Fun fact: Ross’ No. 1 smash single “Touch Me In The Morning” was released on the same day the New York Knicks beat the Los Angeles Lakers in Game 3 of the 1973 NBA Finals — a series that would give the storied franchise its last NBA title. Barry Obama’s love of hoops is one of the most relatable and endearing parts of his legacy. He even had a court put in at 1600 Pennsylvania Ave. Here’s the 44th president sitting courtside at an October 2015 game between the Cleveland Cavaliers and Obama’s hometown Chicago Bulls. John Legend, Benny The Bull, and Chrissy Teigen — Life was all good for the Bulls in 2011. Derrick Rose was a superstar en route to an MVP season. They were the top seed in the East. And Benny The Bull had model Chrissy Teigen sit on his lap while future husband John Legend snaps a picture. 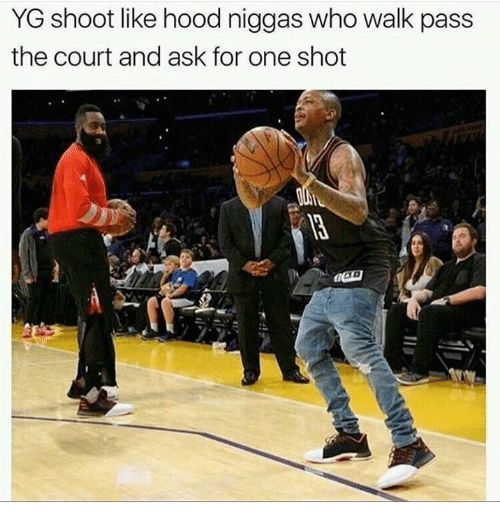 YG and Nipsey Hussle: When they’re not making anti-President Donald Trump anthems, two of L.A.’s finest young guns can be found supporting the hometown squad. This was also the game that birthed one of the funnier basketball memes of the season, too. Supporting her husband, Dwyane Wade, Gabrielle Union takes in the festivities of Game 7 of the 2013 Eastern Conference finals. The Miami Heat would, of course, go on to win that game and repeat as NBA champions. But not without its share of drama. Jay Z and Beyoncé — Sure, the Cleveland Cavaliers fell down 0-2 to the Warriors last year and won four of the last five. But that was last year before a 7-foot pterodactyl with range out of the gym joined the squad. If you’re Cleveland, it’s time to call in the secret weapon: Beyoncé. She look like she’s ready to give birth at any moment to the twins (if we’re lucky, they’re named Bad and Boujee Carter). But LeBron James always plays superhuman — and he’s going to have to play super, super, superhuman to beat the Seal Team 6 Warriors. That only happens if The Queen is courtside. Will Smith and Jada Pinkett — One of America’s longtime premier black power couples is no stranger to the courtside life. Here, the two TV stars turned movie stars share a smooch. The No. 1 all-time Will and Jada courtside story? Three days following the release of what became The Fresh Prince’s most commercially successful album in Big Willie Style and a month before their wedding, the couple attended the Sixers/Lakers game on Nov. 28, 1997. The matchup featured a pair of Hall of Famers dueling it out in Allen Iverson and Kobe Bryant, who came off the bench. But more importantly, the couple got up close and personal with Jerry Stackhouse and Eddie Jones, who crashed into them. Wanda Durant and Marshawn Lynch — In the past year, Oakland, California, has welcomed Kevin Durant — and by proxy his mother, Wanda Durant — and its favorite football son, Marshawn Lynch, back to The Town’s fold. Both pictured here at Game 1 of the 2017 NBA Finals. While it wouldn’t be surprising if the Golden State Warriors held on to win two more games, the more fascinating plot twist is if they let Lynch party with them during a potential championship parade. Mic Lynch and Draymond Green up and show it on pay-per-view.